EDINBURG — Dozens of people put a hard hat on and got an exclusive sneak peek Wednesday of the new Bert Ogden Arena, which is set to open at the end of June. The invitation-only event drew more than 100 curious attendees who were then separated into groups of 15 as they made their way through the guided tour of the facility. Staff members paraded the groups through one of eight bunker suites valued at $65,000 per year before heading onto the main floor, where a variety of food trucks awaited. 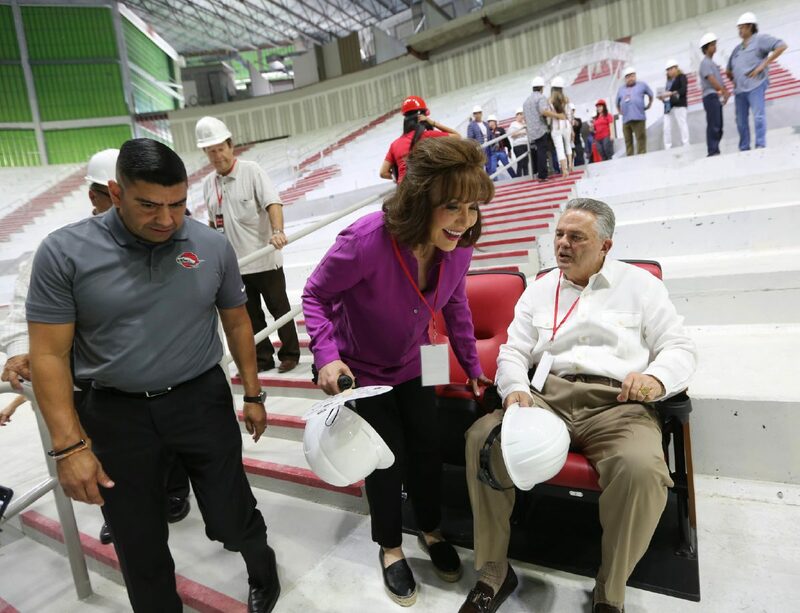 Janet Vackar sits next to her husband Robert Vackar in a sample seat at the still-under-construction Bert Ogden Arena as Rio Grande Valley Vipers' General Manager Bert Garcia gives them a tour Wednesday, April 18, 2018, in Edinburg. The arena is expected to be completed early in the summer. Cantu, who partnered with the city of Edinburg to construct the arena, was very much hands-on with the project, keeping a close eye on every detail from leg room to flooring to decor. 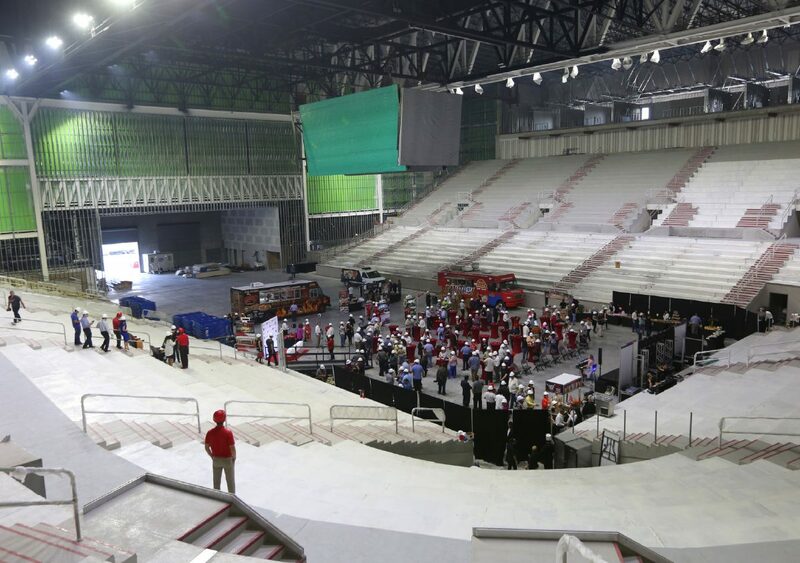 The couple, which owns the business that has the naming rights to the arena, was on hand Wednesday trying out the two cushioned seats that were installed to give guests an idea of what the venue will look like once it’s completed. The $88 million facility is slated to open at the end of June, if all goes to plan. Construction crews were recently able to fully enclose the structure, allowing work to begin on the interior of the arena. “We finally did that last week so now we can work 24 hours a day,” Cantu said. He and everyone around him described the arena as a game changer. The new city council, however, appeared to take issue with the terms of the agreement forged by the previous administration, and Cantu, at one point, went to a city meeting to defend the project. None of the city’s elected officials could be spotted at the event, though, according to Cantu, they were invited. The arena has already booked one act, Mexican popstar Luis Miguel, for an appearance Aug 31, and is working to land another headline act to open the venue.